BoJax Shooting School in Bluffton South Carolina offers shooting classes for all interested law abiding citizens; beginners to expert levels. Youth instruction is common. Coaching experienced shooters is common yet, a strong percentage of our students have never shot a handgun; that is not a problem. Make an appointment and come and see. You do not need to own a gun to take our Level 1 classes. Do you have a gun or two and a Concealed Carry Card and not sure you had enough real training; then you probably have not; Again, you probably have not. Do not be misguided; you do not know, what you do not know, an adult learning enviroment is our goal. Please call and come find out. This is real fun stuff when performed safely; and in one word "awesome stuff" come and find out. Whether you are new to shooting or shooting well; for fun, competition or self-defense. 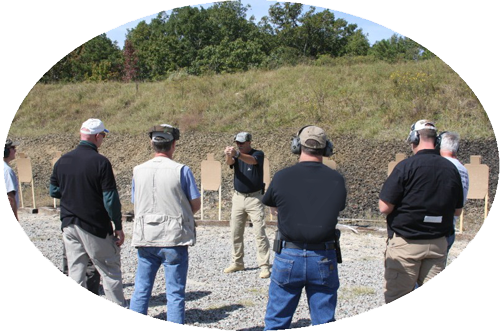 BoJax Shooting School offers real training designed to meet your needs. We can make you a better shooter. With a money back promise; why pay for somthing you do not need. Stephen has worked with and trained under some of the best instructors in the world; as viewed on some of the photos above, he also is certifide to teach several of these methods. In 2008 Stephen won his division (of 16 shooters) at the SC State IDPA Championships by about .58 sec. out of 200 total seconds; by killing paper and steel targets faster than about 50 other shooters in his division and above. The goal is on your performance, safety, sporting, plinking, defensive shooting or private coaching. You don't know what you don't know; the right way to train, the first time. Class sizes are limited for more personal instruction. Homework; reading material and a 2 hr. video are are assigned well before class, during registation, so we are ready to go promptly at 10:05 AM. Students taught a method of performance analysis to be able to improve on their own. All students leave the course with a new sense of comfort; and know-how for being around and or handling firearms, safe operation and self-defense. South Carolina law requires training from a SLED certified instructor to be eligible for a concealed weapon permit (CWP). Utilizing adult learning methods, this class covers all requirements to obtain your CWP. How do modern pistols and revolvers work? Loading and unloading, How do I operate this thing? Come and find out, in a safe, relaxed environment. Mostly classroom however; limited live fire training is provided. We our currently re-working the website. We hope to have online registration up next month and improved information. Thanks to all the students these past several years we have been busy. Copyright © BoJax Shooting School. All Rights Reserved.